Equipped with ATI FirePro professional graphics from AMD, the Matrox Supersight e2 high-performance computing (HPC) platform features a high-bandwidth PCIe 2.0 switched fabric backplane, which supports up to six double-wide or up to nine single-wide GPUs in a 4U platform. In turn, each ATI FirePro professional graphics card provides up to 1600 stream processors and 147.2 GB/s of memory bandwidth. 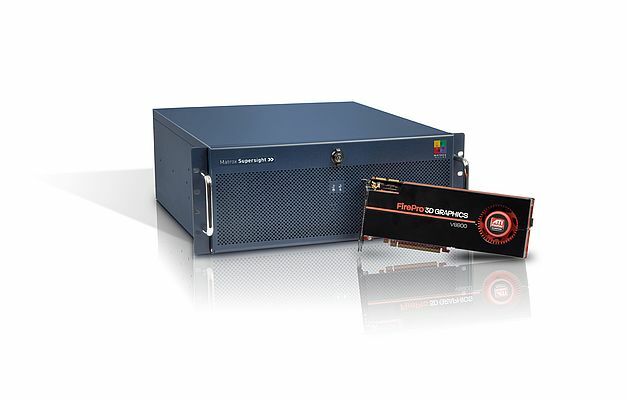 Available with ATI FirePro V7800 or ATI FirePro V8800, the platform provides the architecture and computational power needed to greatly accelerate the data-parallel operations commonly employed in high-throughput machine vision and medical imaging applications. Leveraging multiple clusters of CPUs, GPUs and FPGAs, it provides an environment for considerable data and task-level parallel processing through a PCI Express (PCIe) x16 2.0 (Gen2) switch fabric. In addition, many of these GPU-optimized operations are available through the company’s imaging library, MIL, software development kit. This library, which includes Distributed MIL (DMIL) API, allows developers to create applications for platform. As it is supported on all of the company’s hardware platforms, development is simplified and ensures that the source code is portable across all devices, from nodes with 48 CPU cores and 4 FPGAs, to a node with 12 CPU cores, single FPGA and 6 (double-wide) GPUs, and everything in between.